The past does not define you, the present does. Gantheaume Point, one of my favourite places. Old photo, because I didn't have the camera out much this week. This has been an odd week. Much pain again, with the arthritis flaring with the change of weather. I think summer is finally gone, with the nights getting cooler and the days milder. It’s been lovely to not have to hide away in air conditioning all day, and to have fresh air flowing through the house constantly. The great shift in my exercise routine is happening, too: no more swimming, and building up my tolerance for walking instead. I am entertaining the idea of purchasing an exercise bike for rainy days, but slightly put off by the prices, especially of recumbent models, which I am drawn towards. There has been writing, and I’ve been happy with the quality, but not quantity of it. My pace is much, much slower that I use to write. But I suppose that I should be thankful that I’m writing at all. Between pain, a two-year-old and everything else, it would be very easy to just stop and stare at daytime television all day. I have been devoting a decent amount of energy to uncluttering, which is a very satisfying thing. We’re not messy people, but there are places in the house that get cluttered with stuff, and when they’re clean and tidy, things feel much better. I have a massive list of things I’d like to do around the house (painting, for one, she says, eyeing off the horrid yellow walls in this room) but I’m tackling them in small pieces. They all add up. Watching a child in their second year of life is incredible. Especially when said child is sleeping well, and therefore the rest of us are sleeping well 😉 He’s developing such an imagination – he re-enacts scenes with his trains, and tells us that Totoro lives in every big tree he sees 🙂 He still remains one of the cuddliest kids I’ve ever known, too, which is just delightful. Hard to think that in a few years he’ll be in school. 4 ways to hack into your mind and become infinitely more creative. How to become a real writer. 10 books every fantasy author should read. Why it’s good to give your stuff for free. 10 secrets to creating unforgettable supporting characters. How to create story structure to die for. You must engage your creative side. How I wrote Doll Bones (Holly Black talking word count). An exceedingly simple guide to keeping a journal. How to make a living as a writer, part one. Part Two. How will we get around in the post-apocalypse? I want to make this for my kid: Narnia-themed playroom. I’m not usually a reader to become intrigued about a book based on the cover alone. This series is the exception – one of the blogs I follow posted an image of the cover of World’s End, the first book of Mark Chadbourn’s Age of Misrule trilogy, and I was immediately drawn in. Reading more about the trilogy and the two that follow on, and I was hooked. As an aside, if you get a chance, check out the covers for the other US rereleases – they’re all as gorgeous as this one. If I was Mark Chadbourn, I would be so stoked with the cover art. Unfortunately, my books are a mixture of UK and US releases, based on what was available when I was searching out the books. I’m sorely tempted to rebuy them all in the US covers, to be honest. Anyway. The covers are gorgeous, right? And the subject matter is so up my alley – technology fails around the world, and all of the figures from fantasy and myth come back into the real world. These books are set mostly in Britain, so it’s the Celtic gods we mostly see (though later books reveal that the gods of other countries also come back), as well as dragons. Some of the imagery of the gods and fantasy creatures is amazingly breathtaking, and it would be very easy to imagine this series as a whole becoming a very successful television series. I did have some issues with the books, most of which are character based. All too much of the time the main characters come across as feeling more like stereotypes – there is effort made at rounding them out (usually in the form of tragedies that shape them), but it often feels like too little against the grandiose backdrop of the storyline. The females also get pretty short shrift of things. I found it frustrating that they were clearly delineated as powerful characters, but they never really ended up feeling like they grew into that power. None of the characters ever really seemed to grasp the enormity of what was going on, and too often sank into petty squabbles. Which, sure, are going to happen, but when the world is ending and you’re supposed to be one of these amazing powerful people who are supposed to save it, you should rise about that, right? Hell, this is fiction, after all. That said, I found the characters interesting enough to keep on reading for nine books. I still found myself frustrated with them many times – there are places where they all act out of character, and there are a couple of completely meaningless deaths and acts of violence against the characters (women especially, who very much end up being damsels in distress a lot of the time – though, to be fair, they do their own share of saving others as well). I feel like Chadbourn has really made an effort to try to make all the characters feel human – flawed, making bad decisions, and all of it. Which makes them feel more real in one sense, but also makes them frustrating as heroic characters. The whole series feels very much like it’s been written as a script, rather than a series of novels. This does allow for some amazing visuals, but it does at times, feel like there’s far too much reliance on showing and not telling. That said, telling the story instead of showing it isn’t the be all and end all of everything, but it does tend to make characters feel more like cardboard cutouts than real people. And yes, I know that I’m pretty much contradicting myself here, but this series kind of lends itself to contradiction. 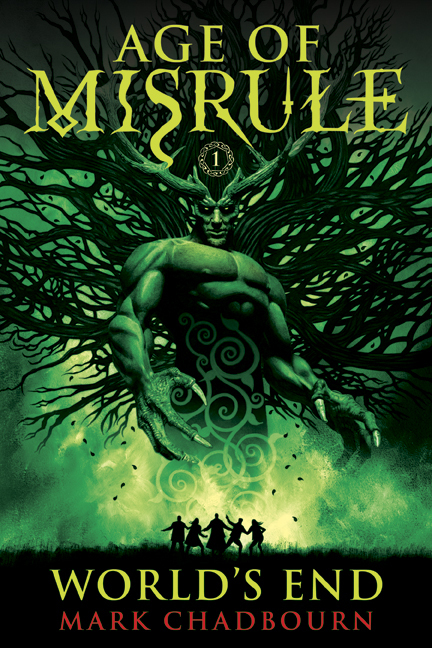 If you love Celtic myth and dystopic fiction, likely you’ll find enough (as I did) to keep you reading this series. I will most probably come back to this for a reread at some time in the future when I don’t have a wall of books to be read. And I do think it could make an amazing television series, if the characters were worked on a little more. Some people might find the characters too frustrating for words, and find that they want to toss the books against the wall. Still one of my favourite songs and video clips. Awesome is having an artist friend who comes over and draws Totoros with chalk on the paving for your kid. Not the best or the most productive of weeks, thanks to a flare up of arthritis pain. But I managed to write every day, and to stick to not breaking the chain. I am officially giving myself the weekend off from work, though – today the husband and I are going to see The Hunger Games in Gold Class, and tomorrow is massage day. In good news, the pain seems to be less today, so hopefully I’ll be back to being productive next Monday. The gift of tabula rasa. A three-step algorithm for happiness. Train your brain for monk-like focus. Cycle to work at your home office. Does accepting limitations make us weaker? What’s the value of SF/F awards to the community? 6 simple ways to release flow. Struggle is a sure sign you’re making art. Here’s a thing: coming up in March it will be ten years since I first fell ill. At first, we thought it was a simple flu. And then I ended up with severe post-viral fatigue. And then everything else – the headaches, the joint pain, the sleep disturbances. Cue two years of struggling through, with the eventual diagnosis of lupus/rheumatoid arthritis (depending on who you’re talking to; for me, the treatment is the same) and fibromyalgia. It’s hard to believe that it’s been almost a decade. This illness was part of the reason that I didn’t pursue a career in science. This illness put me on a disability pension after I finished my PhD. This illness has limited my life, but thankfully, has been treated well enough that I’ve been able to put my life back together, albeit not in the fashion I always thought I’d live. Despite it, I have continued to write, and run a household. Thanks to the support of my husband and family, I’ve been able to have a son. And yet. Despite all of this, despite getting the right treatment, despite therapy, despite everything, I’ve still found in myself a lot of anger about being ill in the first place. This book is the first thing that I’ve discovered that has given me some peace with that illness. I owe a great debt to an online friend who pointed me towards this book (as well as the facebook group that was created to help people work through the book). I am not a Buddhist, and I thought at first that would be a problem with working through the book and implementing work from it. And yet, I didn’t ever find that to be a problem, Bernhard’s style is so open and easy to read, integrating some of her own Buddhist practice in easy ways to help find some peace. I’ve found myself incorporating several of the practices into my life since finishing it, and have found that they’ve given me a lot of peace. 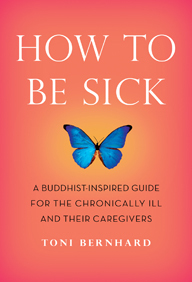 I highly recommend this book to anyone who is dealing with a chronic illness, or to anyone supporting someone with a chronic illness. I don’t believe that anyone should stop fighting to find a way past illness, but there is a lot of peace in acceptance of it at the worst times. And somehow I’ve managed a nomination for the Tin Ducks. Thank you, kindly nominator! Though I’ve not a chance of winning, since I’m up against Tehani, who is made of awesome (and who has written way more reviews than me this past year). Aurealis Awards shortlists have also been announced! I had a great time as one of the judges on the horror panel. Kind of disappointed about the novels, but the quality of short stories made up for it. (And this is not a comment about the quality of novels entered – there were just problems with all of the entered works that made them not quite award winners). Congratulations to all of the nominees for both sets of awards. And don’t forget to nominate for the Ditmars! I have put my nominations in, and have realised how many books I couldn’t award because they’re sitting unread on my shelf. Must catch up with my reading. This has been an…odd week. A couple of days where everything got derailed – husband was off up north working on site and got stuck there when the airport closed due to a cyclone. So the kid and I have been on our own since Thursday. Bless the little guy, he’s been awesome – going to sleep without too much fuss and sleeping through the night. You’ve never seen sad until you’ve seen a two-year-old’s face when you tell him that Daddy isn’t coming home as planned. My heart breaks thinking of kids who get told that Daddy or Mummy aren’t ever coming back. Terri Windling talks about suffering for art. Using Kickstarter to fund fine art. This is how you organise a pantry! The many ways science has (wrongly) assessed your personality. How not to be a clever writer. Photo by the amazing Brooke Shaden. If you’ve never seen her work before, go and look!